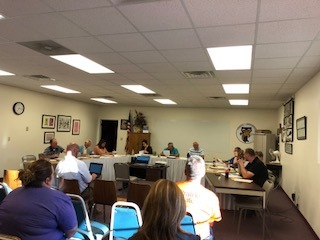 On Monday night, the Taylorville Board of Education held their monthly meeting at the Administration Education Center. First discussed was a consideration of an overnight trip for the Taylorville Livestock Team to attend the National FFA Conference in Louisville, Kentucky and the Livestock Judging Event in Denver, Colorado. That motion cleared unanimously by the board. Dr. Gregg Fuerstenau spoke on what that opportunity will provide the high school students, and the honor of being invited. Also, Taylorville High School’s upcoming career day was discussed. The career day is going to be on October 3rd, and its goal is to expose students to different careers through guest speakers. There will be 100 speakers in total, and each student is required to sit through 4 sessions. The new district website was displayed as well. Since school began, the website has been up and running, however the new district app for smartphones is not quite finished. A video was also showed that highlighted all schools within the district that will play on the website once it is finalized. Following the video, there was a consideration of hazardous walkway resolution, that motion was carried unanimously. The 2018-2019 enrollment was also reviewed, and later the meeting went into a closed session. Following the closed session, Dr. Fuerstenau gave his Superintendent report, and then the meeting was adjourned. Also of note, Senator Andy Manar is going to visit two schools within the Taylorville School District. Fuerstenau was able to speak on that matter as well. The Taylorville Board of Education meets on the second Monday of every month. You can watch the full council meeting here.